Posted by Khawarizmiya in Islam. I met her two days ago. An out-going, kind, friendly British girl in her early 20s. With a beautiful Islamic scarf on her head, she talked to me a little about her story with Islam. She told me how it started on September 11th, 2001. After hearing so much about how those terrorists embraced a radical religion, Islam; a religion that undermines women’s rights and invites its followers to attack people and murder them brutally. She started digging around, reading for 3 years about this mysterious Religion, strongly impressed by how what she read turned out to be the opposite of what she had heard — especially regarding “women’s rights”. "اليوم أكملت لكم دينكم و اتممت عليكم نعمتي و رضيت لكم الاسلام دينا"
“Bless him”, she said, as she started talking about prophet Mu7ammad (صلى الله عليه وسلم). “People say we need a prophet these days, I say how can someone so pure live amongst all this corruption? Bless him”. “We used to be taught that we need to expose our bodies and look physically attractive in order to get guys’ attention. I always felt wrong doing that. Why should my beauty be exposed to all those men? How can their judgment of me be so shallow? “Hijab” made so much sense to me. Yes. It’s lovely. Hiding my beauty and only showing it to my husband just made sense”. There were many people from different origins sitting around us. 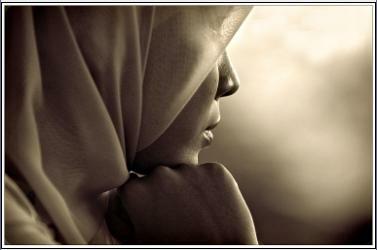 She looked around, smiling as she described another blessing she felt when she came into Islam. “Sisterhood. A lovely bond. I just can’t describe how blessed I feel”. At this point, our conversation came to an end as we had to leave. I rewinded our conversation as we parted, thinking: Do we really know how blessed we are? I’ve been living in this great blessing -Islam- for all my life, I have nothing else to compare it to. Maybe if I had, I would’ve appreciated more how Allah spared me the suffering of struggling hard to find Him, by guiding me to his Book, his Prophet (PBUH), his way. Yes, I’m not a good follower, but I have “answers”. I know why I’ve been created. I know why I’m wearing this beautiful 7ijab on my head. I know what afterlife is all about. I know that exposing my body is not freedom but slavery. I know that women were given their rights fully in Islam when no other religion or constitution ever been any fair to them. I don’t know everything, but I have Allah’s book in my hands. Is Islam a forgotten blessing that we rarely thank Allah for, nor even feel it, as does this young, beautiful lady? Seeing her eyes glow as she speaks of the happiness and serenity she’s thankful for, triggered this question in my mind all night..
Of course it’s a forgotten blessing for many people, including myself. We take Islam for granted since we were born Muslims. As you said, we know the pillars, we know what is right and wrong, but we don’t really contemplate the religion. What we do, how we live our lives is mostly out of habit, out of culture. Can you tell me what is it that we do, as born Muslims, to benefit our beloved religion? Nothing at all. I know this girl who has great ambitions. She wants to excel in her studies and move on to postgraduate studies. She then wants to work in her field and “invent” something, not just apply what she has been taught. Not only that. She is learning the Quran mashallah. And participating in sports. Her goal is to portray the Muslim woman to the Westerners as one who can do and enjoy everything in life, within the guidelines of Islam. Lendmeurear, that sounds like a great example for a successful, ambitious Muslim woman. You’re right, lots of what we do stems from culture, traditions and habits. If we explore the glory of our Religion further and learn what and why the Islamic teachings are all about, we’d be the first to call onto them and practice them in our daily lives. I think you summed it up with the title, a forgotten blessing! when I came to Canada I started to feel the difference. I saw what is really called being lost! I understood why people commit suicide. It was all trivial once you start arguing religion with an agnostic! Thank god I came to Canada. Now I know what is “Islam”. I think one keyword you mentioned is arrogance.. sub7anallah. Isn’t arrogance what makes some us Muslims -as well- too proud to adhere to Islamic teachings & principals..
Nice experience you got there.. It is human nature to value more what they have worked so hard to get or achieve. We, alhamdulelah, as muslims were born into the religion, and yes we take it forgranted. But converts (or reverts) like you said, research and work so hard, day and night, to find the truth. And when they finally find it, they know in their hearts that it is the truth. It gives them peace, serenity and happiness that they’ve been missing their whole life. So they hold on to it, tooth and nail and never want to let go. It is clear to them now how trivial and temporary life really is. Unfortunately, we as born muslims do not realize the blessing that we’re in. So yes, Islam is a forgotten blessing. And you know what’s even sadder, a lot of converts/reverts here in the US criticize born muslims on their actions. They can’t fathom why arab muslims do the things they do. They don’t understand WHY. One girl was telling me, how could they act like that when they’ve had this blessing all their life? And I’ve been miserable and searching most of mine. Allahoma la taj3al mo9eebatana fee deenina w thabitna fa 2anta 2a3lamo bima tokhfee al 9odoor. a) True, they’ve worked hard to reach what we were born with. El7amdulelah 3ala ne3met el Islam!! You said “Arabs” in particular. Lel asaf, it seems that any negative habits that Arabs carry sort of reflect on people’s perception of Islam. I think that Arab Muslims carry a greater responsibility than others of portraying a decent image of how Muslims should be like, but unfortunately it seems like they’re not fulfilling that role.